About Scott S. Message Scott S.
We had a wonderful day in Munich with Scott! It was like hanging out with an old friend. Plenty of history, seeing the beautiful sites of the city, and many stops for great food and beer. We had a fabulous day with Scott! He had touched base by text the day before we were scheduled to meet. The day of the tour, he arrived early. He was professional yet extremely personable and friendly. He was extremely knowledgeable on the history of Munich and, of course, about beer. We learned so much about the city, its beers, its foods and its culture. We could not have asked for a better day in Munich. TOUR GUIDE RESPONSE: Thanks for the great rating! It was nice to meet you both and share my love of Munich with you! I'm really glad you got a taste of the Stammtisch culture and got to enjoy the band on Sunday morning! This was a fantastic tour! Scott is an very excellent guide. He helped us will finding a great hotel in Munich and provided detailed information about airport arrival, purchasing tickets for the U-Bahn. In addition to the amazing castles and good conversations we had several other stops at cathedrals and beer gardens. Highly recommend. Scott was an excellent guide. He is fluent in German and English. Our Munich day tour was excellent. It was a great mix of history, architecture and education about German beer. Scott was an excellent guide and we had a fantastic day in Munich because of him. We were shown a number of gardens all over the city, tried many different beers, and learned a lot about Munich history. If I am ever in Munich again I would plan another tour with him. TOUR GUIDE RESPONSE: Thanks for the great review. It was a pleasure to host you both here in Munich! Scott was an excellent guide. Very knowledgeable and helpful. When he found out we both had colds he gave us some DayQuil to help us!! After the tour he took us to Hofbrau Haus and two other local places to sample the beer and food. Then he took us on the Subway and dropped us off at our hotel. It was by far our best tour experience!! TOUR GUIDE RESPONSE: Danke schön! I loved showing you around Munich and enjoyed the time with you very much. Hope to see you again! We had a great time with Scott. 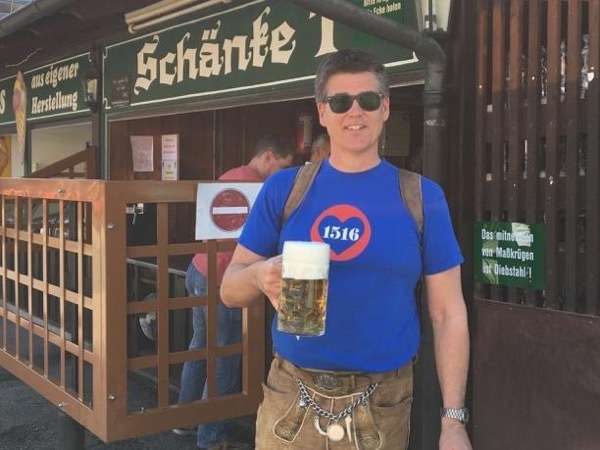 His knowledge of the beer culture and industry in Munich and Germany in general was impressive. I was a little concerned about him not being originally from Munich, but that concerned vanished very quickly. If you are thinking about taking this tour, do not hesitate. TOUR GUIDE RESPONSE: Thanks for the wonderful comments! I had a great time with you guys and wish you all the best with your future endeavors! Easy to arrange and tailored to the specific requirements of our small group. Scott was efficient, informative and very friendly. We very much enjoyed the tour and would highly recommend.